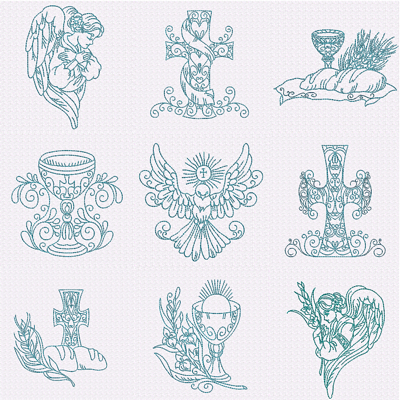 This detailed set of redwork designs consist of 9 symbolic designs representing the basic tenants of the Christian faith. This set contains a selection of crosses, a Dove, chalices, bread and wine and 2 beautiful angels. All elegant expressions ready to embellish gifts of faith. 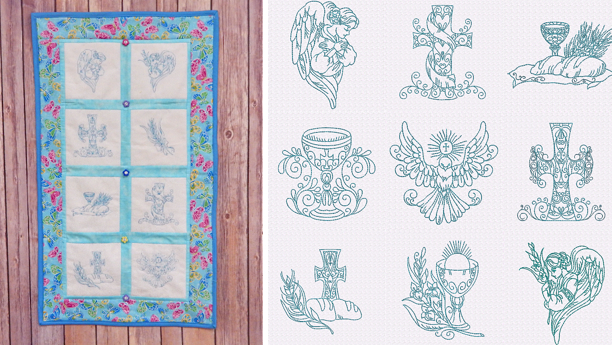 These designs are perfect for both church and home linens, faith gifts and embroidered decor. From alter cloths to Sunday dinner napkins, Eucharist linens to tea towels and mantle cloths, for Easter embroidery to Communion gifts, this set has numerous designs perfect for many occasions. 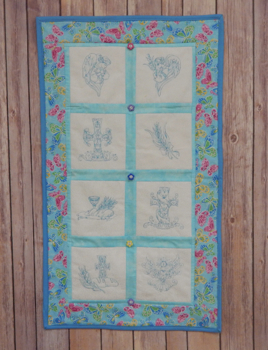 Stitch an angel hanky, a journal cover a note card for a friend, bread basket warmer or bible cover, the ways to use this set are endless and thoughtful, a beautiful way to showcase your faith, to bless or encourage someone in need. A quick to stitch gift set for all occasions.